The President of the main opposition party of New Democracy, Kyriakos Mitsotakis, explained his position on the ratification of FYROM’s accession to NATO in the Hellenic Parliament. New Democracy voted against the accession protocol. According to mr. Mitsotakis it is simply the final premeditated act of a damaging agreement. 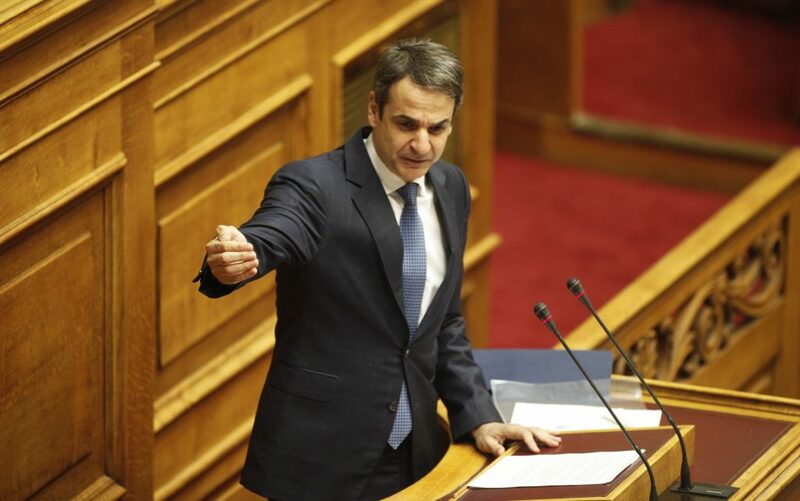 Mr. Mitsotakis denounced the parliamentary tactics of the government saying, “you are a majority government based on occasional and temporary majority to stay a little more on power. This is an agreement based on willing MPs but being against the will of the overwhelming majority of the people”. And continued by saying, “rather than going to elections, Tsipras attempts to continue its political legitimacy. What is done is an expression of unprecedented institutional irregularity. Every day we think it does not get any worse. Everybody sees the bargaining that takes place. Consciences have been exchanged with portfolios and government posts for either staying government or passing the Prespa Agreement”. Prime Minister Alexis Tsipras, answered that, “you have told us today that he will welcome the ‘Macedonian’ Army to NATO. You are deliberately twisting the truth. You know that the official name will be an Army of ‘Northern Macedonia’, which should be an ally in Greece and not turn its ‘arrows’ against Greece. Together with the Greek Armed Forces, it will be a pillar of stability”. Earlier ANEL’s President and former Defence Minister, Panos Kammenos, reiterated SYRIZA’s “plans” to “silence of the Independent Greeks (ANEL)”, saying that, when he had revealed this view to Tsipras, the prime minister appeared to be surprised. “As you can see”, he added, “today after my speech and after Mr. Papachristopoulos is expelled from ANEL, it was decided that ANEL should not have the right to speak, to participate in the Committees, the right to exist as a parliamentary group. We have been government partners and supported this government’s work. With our vote and backing, we put the country out of the memoranda”. FYROM’s accession to NATO was ratified by the Parliament in the vote that followed. The former MP of ANEL, Thanassis Papachristopoulos, after changing his mind many times in the past two weeks, finally resigned right after the end of the voting procedure.